Each of the four glass pieces of glass is 0.5mm in diameter and made of two layers of glass. A Black layer followed by a layer of multicoloured Dichroic glass fused together. 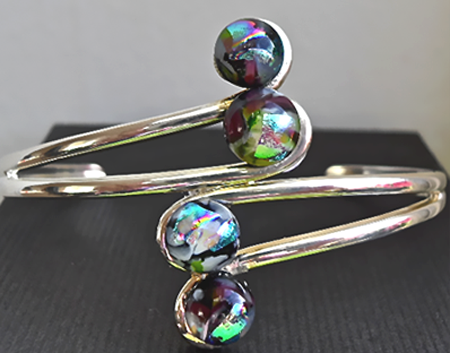 The bangle is very good quality plated silver and is adjustable so will fit most wrists. It comes in a nice silver card gift box. I have it in a number of other colours.